Intelligence is our ability to learn appropriate responses to new stimuli and situations. Neurons in association cortex are thought to be essential for this ability. During learning these neurons become tuned to relevant features and start to represent them with persistent activity during memory delays. This learning process is not well understood. Here we develop a biologically plausible learning scheme that explains how trial-and-error learning induces neuronal selectivity and working memory representations for task-relevant information. We propose that the response selection stage sends attentional feedback signals to earlier processing levels, forming synaptic tags at those connections responsible for the stimulus-response mapping. Globally released neuromodulators then interact with tagged synapses to determine their plasticity. 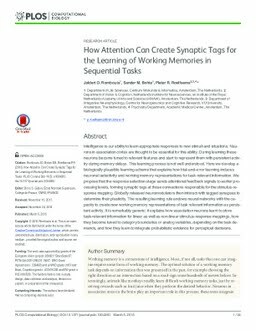 The resulting learning rule endows neural networks with the capacity to create new working memory representations of task relevant information as persistent activity. It is remarkably generic: it explains how association neurons learn to store task-relevant information for linear as well as non-linear stimulus-response mappings, how they become tuned to category boundaries or analog variables, depending on the task demands, and how they learn to integrate probabilistic evidence for perceptual decisions.